Sierra is comin’ back, ya’ll! Activision has a brand new teaser showing off a new modernized logo, and I’m finding it hard to contain my rush of nostalgia. I know it will just be an empty shell of its old fame, but please, just let me enjoy this for a few minutes. Sierra is a name that might spark both frustrating and pleasant memories from a lot of classic PC gamers. The company was at the forefront of graphic adventures in the late 80s and early 90s, churning out hits like King’s Quest, Space Quest, Police Quest and Gabriel Knight. All revolutionary games in their own right, but all downright frustrating with Sierra’s “take no prisoners” approach to logic and puzzles. After the genre died off, Sierra’s final huge impact on the PC gaming market was publishing a few small games you might have heard of called Half-Life and Counter Strike, early hits by this tiny company named Valve. It dabbed in Vivendi properties like Spyro the Dragon and Crash Bandicoot for a while before closing out its existence by publishing the Xbox Live Arcade hit Carcassonne, the wonderful RTS World in Conflict, and the generic FPS TimeShift in 2007. Sierra found itself fatally entangled in the Activision corporate web when parent company Vivendi merged to become Activision Blizzard in 2008. Performance was not up to speed with the new image its corporate overlords wanted, and Sierra was shuttered by Activision later that year with the hopes of a sale that never materialized. With nothing else to do with the aging brand name, Activision is bringing it back. I’m not sure if I’m excited or not to see what it has planned for it. 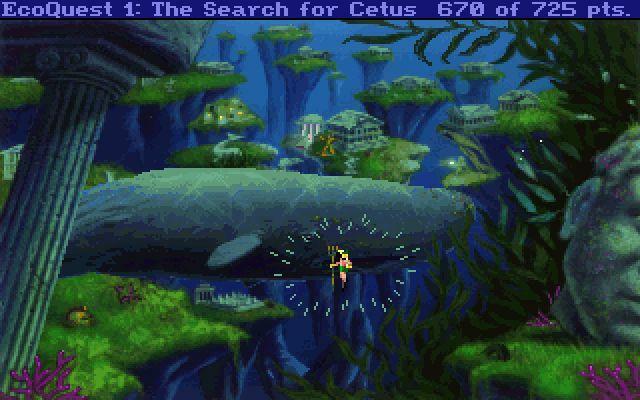 Will Sierra be called upon to create a line of classic style PC games overflowing with thought provoking and frustrating adventure game traditions? Will it lead Activision’s new charge into the mobile market, or is it just a recognizable name that it will exploited for its latest annualized franchise? Who knows? Sierra fans! What is your favorite game from its classic library? I like watching King Graham and Roger Wilco get killed in the most gruesome ways possible as much as the next guy, but I’ll always have a soft spot for the EcoQuest games. Cleaning the ocean and saving the rain forest never felt so fun.